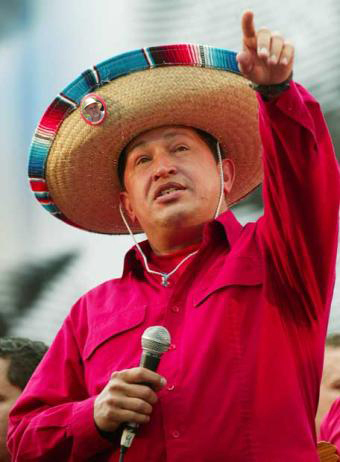 Hugo Chavez of Venezuela, stunned supporters when at a rally yesterday a Mariachi band appeared behind him and he suddenly donned a large sombrero. 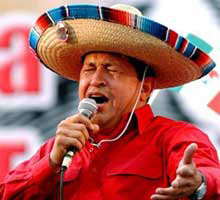 Breaking into song he announced "This one goes out to mi hombre aplaste, PJM of West Texas. You're my numero uno, Amigo!" but you should know now, you occupy my heart. I would nationalize the world for you! In other news, Super Villain PJM of West Texas recently revealed that he has hacked into private e-mail accounts and is actively engaged in intercepting international telecommunications. I'm very concerned that he now possesses SPAM capability, so if you receive suspicious e-mail with titles like, "buy cheap peacock eggs," or any e-mail from a Texan Prince asking for your assistance in moving millions of dollars from his homeland in exchange for a percentage reward in assisting him, delete these immediately. He even went so far as to post snippets of my e-mail (intentionally edited to make me look bad) to one of his former victims now in hiding in a remote location in East Africa. In the e-mail, I was asking for photographs of the elusive villain. Why, you ask? PJM is a man with a thousand disguises (most of them hats). As he slips in and out of our peace loving society, we must remain vigilant in keeping the public aware of his every move. If you recognize him, please take every precaution for your own safety. Remember, this is the man who ended the beloved Mystery Person contest and who weaponized peafowl excrement. Who knows what other villainy he may be devising. Love the little PJM pin! Too cute!